Let me introduce myself: My name is Miriam van Santen, I was born in the Netherlands and live in Hamburg, Germany. I’m an advanced student of Monty Roberts, have studied his concepts since 1997. 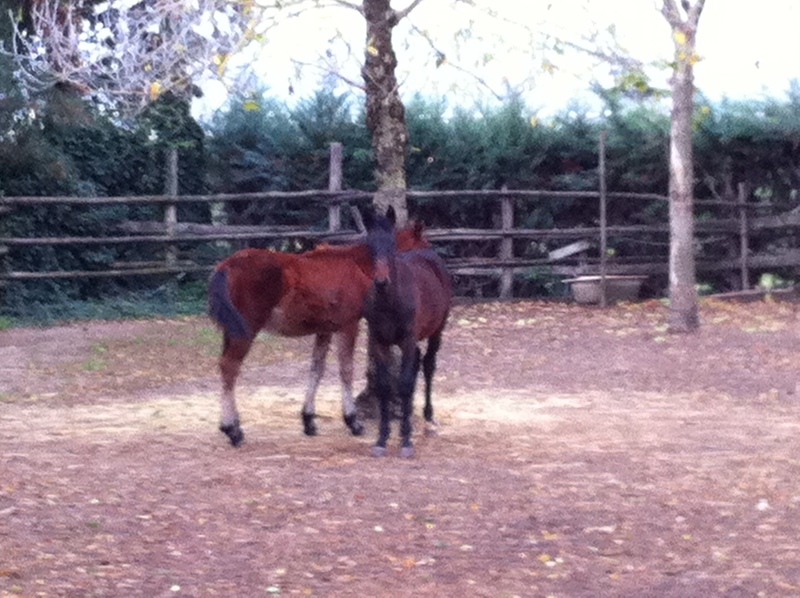 Every summer my family and I spend our vacation at the facility for Maremma-horses of friends in Tuscany. Those friends and I share a passion for horses, in the course of the years our directions of view concerning horsemanship have grown towards each other. My influence and their traditional approach have been a successful ground for growth on both sides. Father and daughter have supported all my attempts to learn and to share it with them and their horses. 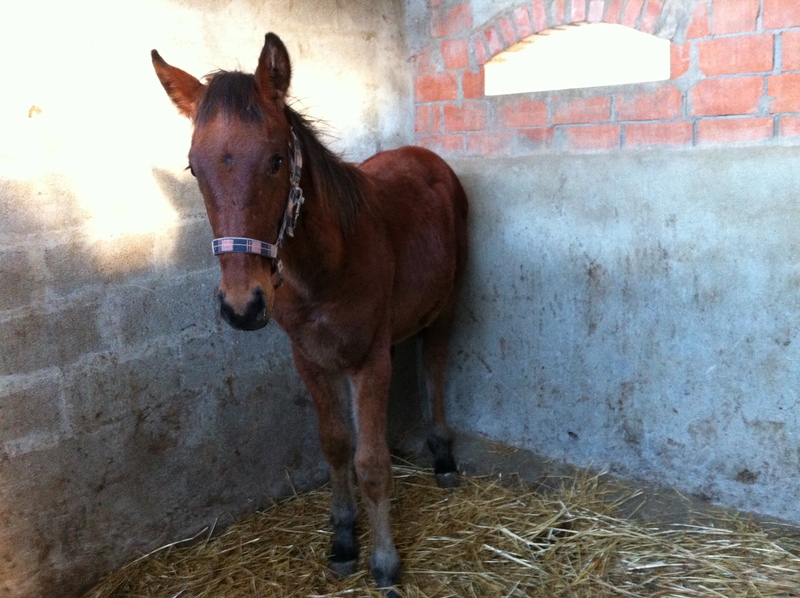 ….and then I came upon the videos of Anna Twinney, her untouched foals gave me so much to re-consider! So I suggested we try this method, as far as it’s technically possible at their farm. Below you find my day-to-day journal of this wonderful week in October 2014. Before my arrival the weanlings had two weeks to settle in after being separated from their mothers at the other farm of the same owners, high up in the Apennine hills. These weanlings hardly even see a human being, there’s one man checking on them and the water daily, for the rest they are growing up quite wild. The facility where we worked with them is next to the owners home, still on a hillside, so they have upper and lower paddocks. The upper paddock is connected to the stable, so we used that one for our daily work. The lower paddocks have a chute nearby, we had to use the chute for one colt only. All others were comfortable with learning to be touched in their stalls. Circe : One and a half year old filly, that I have been working with last year, helped as a leader in our small herd with 2 weanling. The farmhand Maurizio had some problems with leading her, she had kicked his elbow when she reared. So we started the day with a lesson in leading, backing-up, leading with purpose. Then we separated the group in three stalls, let them find hay and water there and settle in. Doge : After his settling in the box, I entered and waited until he relaxed and started eating again, left him. Next time in, I brought a chair and sat down with no agenda. He slowly approached and tried my boot, smelled my clothes and breath, left him. Dardo : After settling in his box, when he was eating his hay, I went in and he continued eating, left him. Next time I brought a chair. When I sat there he bumped his head at the drinker, he settled quickly, my breathing helped. There was no approach from his side, I might bring a bowl with hay next visit. He was not tense with me in his box. Doge was very tense before my entering, because of flies and mosquitoes. I sat down with him again, when he relaxed I got on my feet and made movements like stroking him in the air. Later I took a stick and made the same movements, succeeded in touching his shoulder and left him. Next time I could stroke his nose with the stick. could move towards the shoulder. His neck was tense, then it was better, and as he begin to like it, I left him. Dardo I could stroke with the stick at the nose immediately, so I moved on quite soon to the neck and the shoulder. Next time I shortened the stick, so I could stroke him with the back of my hand. After sundown we let all 3 return to their paddock for the night, it was a better move than in the morning. After mucking out the stalls and preparing them with straw, hay and water, we herded the foals into their stalls and let them settle in. Then we did a great job herding, separating and putting into the chute two weanlings that were sold. The new owner came to pick them up, we herded them towards the stall where the ramp of the trailer was. Smooth herding-in and off they went. Happy new life! Our filly and two colts were already settled in their stalls after spending the night together in their big paddock. Doge : I returned a moment to touching him with a stick, then I could come in with my hand. He kept coming in with his head, so I could offer him my second hand. This way the step towards using two hands was very natural. To make sure he doesn’t freeze in place, I build in some moving forward and blocking, which he did very well. Touching the cheek was good, the nose somewhat hesitant, no extreme reaction, just not comfortable. Covering the eye was good, massaging under the eye was tolerated, not more. Lots of approach and retreat. He shows me where I can go and where it’s still “no go”. Dardo : He hadn’t touched his hay, so I moved it to another angle of the stall, there he appreciated it better. So eating was still an item. To show him that this is a lesson, I invited him to put his head up a couple of times, which worked very well. I kept things short, could touch his shoulder with the stick, then with my hand and added the second hand moving it along the first arm. We did some moving and blocking, so that I could place him in a good, safe spot and then lift him to his hay. Circe : A short session of haltering in the stall. invite to come forward and go backwards, so she’ll place her feet where they’re asked to go. She tends to show some signs of resistance, short corrections are enough to keep her with me. She’s had a shoulder-injury, which was cured for some weeks, so I think she was a little spoiled. She needs a task and someone who knows how to correct her little vices. Hormones involved? Beautiful filly!! Returned to my two colts, touching them with my hands, then with the horseman’s rope, put it on their neck and invited one step in both directions. There was no great reaction when I first left the rope dangling, so we could continue. It’s nice to have more than one foal, so I can let the lesson sink in and come back later! A simple plastic brush went well with both, they accepted it well, the neck was less easy at first, slow firm strokes were best. Then I moved on to introducing a halter, getting them accustomed to the touch and the sound of metal. I could put it around the neck and invite the nose in. With Doge there was a reaction at first, later he accepted the feel of the halter around the nose. Repeated the nose-in several times, then left him. We transferred the last 2 weanlings from downhill to the uphill-paddock, which went smooth and well. 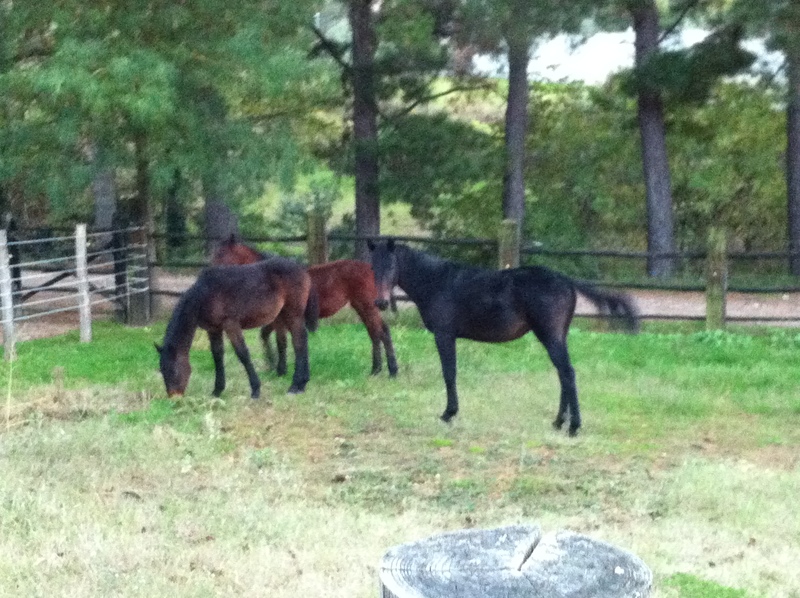 So now our paddock is filled with 4 weanling colts and 1 yearling filly, five beautiful youngsters!! Some hacking-order-issues, then all ate from the same pile of hay… Goodnight!! Separated the herd in 5 box-stalls, Drappo turned out to be a filly called Divina!! I sat down with her and DIttatore , huge difference in character… She settled in nicely, was curious and came to smell me almost right away. He was in flight-mode for quite some time, turning his bum towards me. After some short lessons he understood, that I leave him in peace, when he has his head towards me. Some herding in the stall, so he knows he’s supposed to at least look in my direction. I used a stick to direct him, to stay safe. He’s the youngest and biggest of the weanlings, this line of breed is less available when less high in blood. Originally the Maremma breed was bred for heavy work in the mountains and cow-work, nowadays more hunter-jumper type. You can see the difference from their appearance. Dardo was the hero of the morning, I could put a halter on him and leave it for the rest of the morning, coming in regularly to do some small leading-exercises. At the end of the morning I could come in and take the halter off like he was an adult horse!! It’s wonderful to have Circe around, she has her rest in the box, since she’s the lead mare during the night. She loves to be groomed and do some disengaging-exercises and to be able to eat her hay in peace. I’d love to do some leading with Monty Roberts’ Dually-halter with her, but only when I’m not alone in he stable. It might work out this afternoon. Provided water and hay for all – lunch break! Started with cleaning the paddock, fresh hay and water to all. Divina I could touch right away, she’s at the door when I stop at her stall, very engaged. Brought a brush, could stroke her, left it at that. Dardo : One more time I put the halter on, pulled the rope through the ring and invited him one step towards me. Worked very well. Some disengaging the back-end and then more than one step, following the rope. Still hesitant on the off-side, blocks at first, then opens up. No problem taking the halter off and putting it on again. Doge : Olivia (the horse-owner) came to put the halter on, which was quite a long story, but in the end she managed to put it on twice (over the ears, not opening the top-strap). We’ll have to work on that some more, still he’s not tense, just “no-go” around the nose. Fed the paddock and released the foals into the sunset. Sleep well!! Today I asked for the red Dually-halter, it was found wet in the trailer, so now it’s drying in the autumn-sun. We might be able to use it this afternoon, if not, then tomorrow. 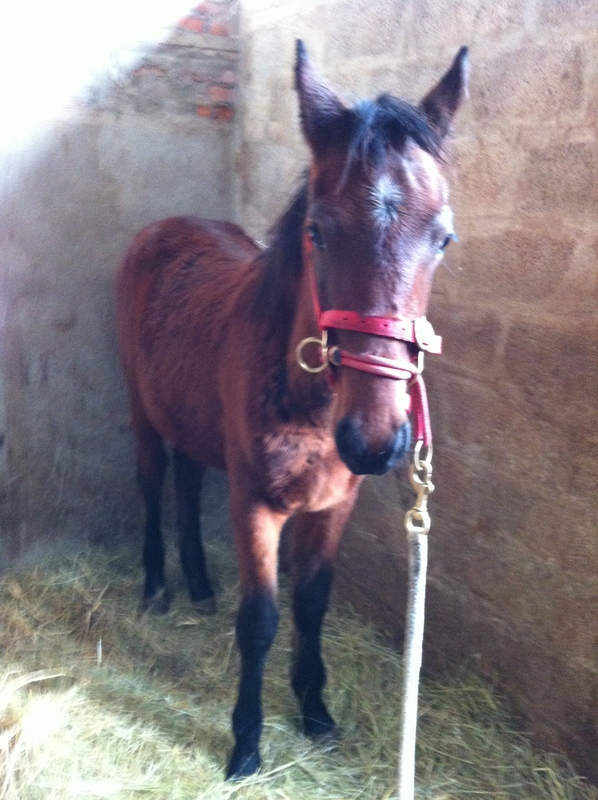 Divina had her first rope, later her first halter on, some steps following an invite. Touching her is no problem, ears at the beginning, then she desensitized quickly. What a treat, this filly!! Doge : Olivia came back for more haltering, after yesterday’s session. She tried to put the halter over the ears, which was still more difficult for him. We went back to using a rope, then opening the halter and putting it on. It’s still an item for him, but he seems more relaxed allover. Provided hay for our break, cleaned the paddock and: lunchtime, well deserved!! Monty’s Dually was dry enough from the sun, so I could work with it, what a wonderful tool it is!! Dardo accepted pressure from the Dually very well, he had already learned to give to pressure from a normal halter. He did some good following, disengaging and backing-up from the Dually. I made it a short session, just to continue our work from this morning. Started to let my hand slide along his forelegs, all good. Then I went to Circe with the Dually. Since she tends to rear, I was very careful to keep her attention and to correct her quickly before she gets thoughts of her own… She did very well in all 4 directions; disengaging the hind-end and backing up keep her attention with me . 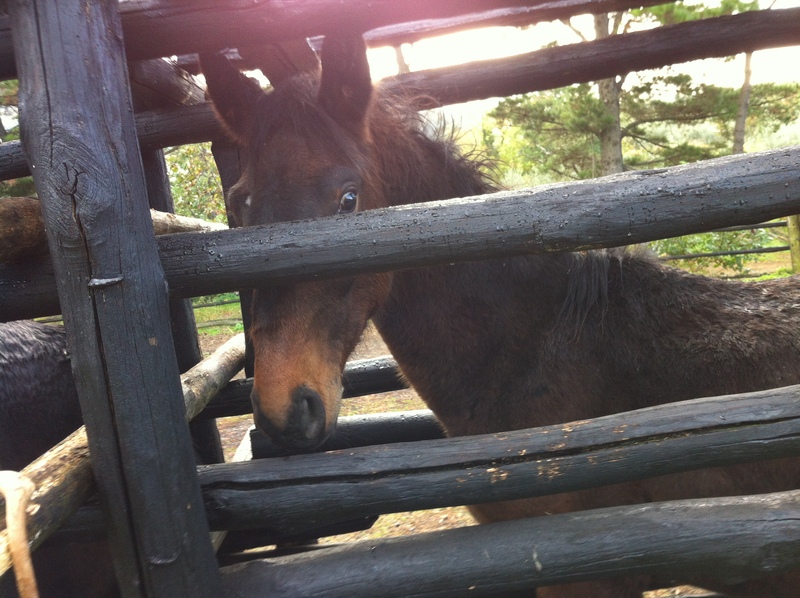 Divina was divine… she’s learning so quickly! I let her wear the halter for some time, invited her to come off pressure, follow the rope. I put the halter on/ off several times, came back to it later, could go straight to the halter, hand on the shoulder and did some neck-yields. She’s interested and relaxed. Doge : I managed to have several short sessions of haltering, he tends to put his head up, so I kept it up, then he lowered it. Then he tries to turn is head away, all the way around, so I opened the halter even bigger. This way I could put the halter on maybe 20 times, still he tries to avoid it at any new start. It’s no problem taking it off and then putting it right on again, but when it’s a fresh start it’s difficult at first. With time it’ll fall in place!! This was an easy afternoon, also because I had already cleaned the paddock this morning. With the lights on we released the foals one by one, so they could find their way to the paddock and each other’s company. The moon lighted them after we switched off the floodlight. We started the day with putting all foals into their stalls, then we took Circe and Dittatore downhill to another paddock, so that we can have him in the chute tomorrow. We could have used more hands to herd them, but we managed in the end to have them safe and relaxed in their new environment. So now we have Divina, Dardo and Doge in the stable. Today I started with touching legs, after grooming all with the plastic brush. I had the Dually on Divina and Dardo with the long lead rope, so they can get used to the weight. When I first touched Divina’s foreleg, she tried to “bite”. I ignored that, but then I kept her head away from me, it didn’t occur again. Dardo was good at having his legs touched, I even moved towards the hind legs. No picking-up feet yet, but he’s OK with my hand sliding down. I prefer having a second person holding them, when I start picking up feet. Those two youngsters are engaged and curious, I might move on to putting a saddle pad on, to prepare them for eventually something on their back later in life. With Doge I continued haltering, he’s still quite tense, even when nobody’s in the stall with him. I put the horseman’s rope through the billet of the halter, as Danilo suggested, so I could swing the halter around the nose. Still some struggle, but never any danger. He just tries to avoid having his nose in… Once it’s on, there’s no problem playing with almost off and on again. Hay and water for lunch, I went to Arezzo! The day started cold with fog, the sun came out and we still have another warm autumn day, one of the last ones! Went in to groom all 3 with a soft brush after the plastic one. With the soft brush I could also do foreheads and noses. All liked it!! Then I came back to Doge with my soft lead rope, made a long loop and let it slide down his face, caught! 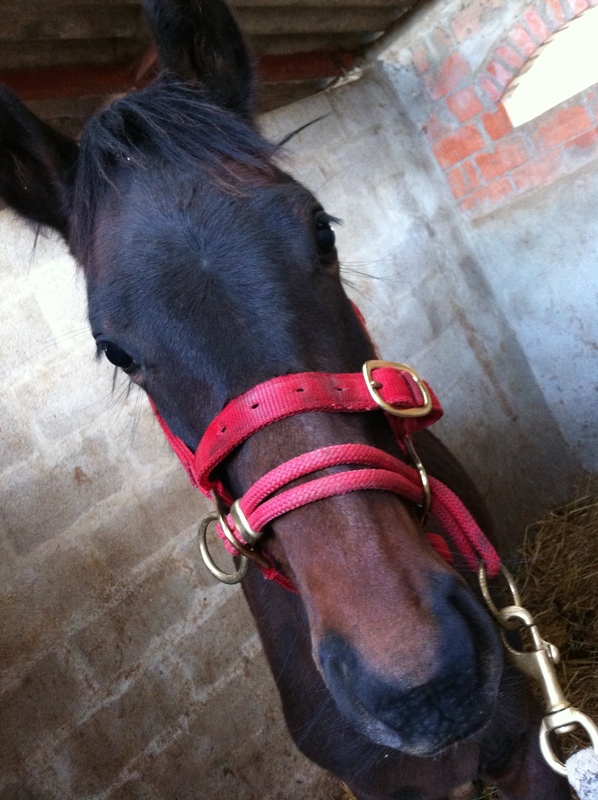 I could turn his head towards me and put the halter on… did this many times. Now for the first time he let me stand in front of him and rub his forehead, go down towards the nose, after some resistance he turned out to like it, soft eyes and no trying to get away. Even when something fell from the roof, he startled a little and relaxed again immediately. We might have found the right button to push…it’ll show tomorrow. The 3 weanlings left uphill seem to have found their routine, they know that at sunset they’ll be outside together, they start calling each other and waiting at the door. Off they went calmly, waiting for each other and happy to find their space and hay for the night. After herding the three foals to their stalls, Olivia and I went to those two downhill, to work with Dittatore in the chute. We had Circe entering first, so she gave him some security, and let them settle in for a moment. He kept his head down, trying to make himself invisible with us around. Olivia started touching his shoulder, moving quite quickly towards the neck and head. He dealt with it very well. So we put the horseman’s rope around the neck to be able to guide the head and then introduced the halter. She let it dangle around the neck first, then with a good swing had it on. We let him digest it and then repeated the procedure twice. Having the halter on, she touched him at the shoulder, at the croup and then we released the two into their muddy paddock, which is very slippery after last night’s and this morning’s rain. Fortunately the sun came out to dry it all. Up we went for our three weanlings. I started with Doge , putting my soft lead rope around his neck and head, like I did yesterday and without much discussion I could put the normal halter on. Had him relax with it and invited some steps toward me and some disengaging. That was his lesson for the morning. We went to Divina, who gave us a hard time, being excited with two people around. She was quite defensive, Olivia had some trouble not having her turn her bum towards her. She put the halter in, it was not easy to handle her. I took over, made her take some disciplined steps, following my movements and we left it at that. Our little star Dardo made our morning, after some small exercises in the stall, we invited him into the stable, which went much better than last time. He learned to step over the gutter, follow steady walk up and down the aisle, even if Divina went crazy in her stall! She thought we would leave her behind… Peace returned as Dardo went back to his stall for lunch-break. Accelerated learning!! All three had the Dually-halter on, all came off of pressure, one better one less good, but the principles are there. I had Dardo come out of his box-stall once more, followed me and the halter perfectly, was very sensitive at going backwards. He hesitated going back into his stall, since time was almost due to go to the paddock. With the presence of Maurizio behind him, it worked out fine. I was done for the day, so I decided to let them go somewhat earlier…Just at the moment their gate closed, Olivia came to ask me if we could separate Divina, ad herd her downhill to Circe and Dittatore! Olivia wants to start with two weanlings and then switch to one or two others. Circe looks for all possibilities to just be smart, so we had some work to have them enter the downhill paddock again, this time the three of them! It’s a great feeling to know that this week I made the difference to these weanlings, let them have a happy winter- we’ll meet again next summer, as far as they’re not sold…..